Edam is typically sold in rounded cylinders with a rind of red paraffin wax. 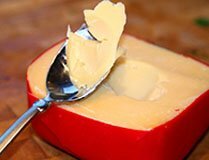 Edam is a sweet curd cheese, that melts easily, making it suitable for soups and sauces. It tastes mildly tangy and slightly salty, and has a semi-hard pale yellow texture.